Bosa tallied two tackles and a half-sack during Saturday's loss to the Ravens. Analysis: Bosa continues to work his way back into the rotation after missing the first 10 weeks of the season with a foot injury. After only seeing 31 and 33 snaps in his first two games respectively, Bosa's snap count jumped to 57 on Sunday night. Look for the snap counts to continue to increase, leaving a good chance for more sacks down the road. Analysis: It appears as if Bosa is fully healthy, as the defensive end terrorized quarterback Josh Rosen throughout the game, recording the only two sacks of the contest. He'll face a far more difficult task next week against Ben Roethlisberger and the Steelers. Analysis: Bosa finally appears to have fully recovered from a foot injury sustained in early August. The 23-year-old made his 2018 debut last week in a rotational role, and is on track to retake his normal starting workload against the Cardinals on Sunday. Now back to full health, Bosa will line up opposite Melvin Ingram and shore up the edge of Los Angeles' defensive line. Coach Anthony Lynn said that Bosa (foot) will start against the Cardinals on Sunday, Eric D. Williams of ESPN.com reports. 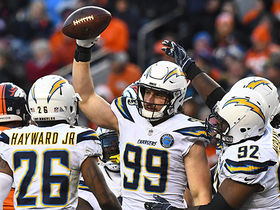 Analysis: Bosa made his 2018 debut during Sunday's loss to the Broncos, but played only 31 of 56 defensive snaps and served as a backup to Melvin Ingram and Damion Square. The 2016 first-round pick did not suffer a setback during the Week 11 loss, and finally appears to have gotten healthy enough to return to his role as a starter. With Bosa returning to the starting lineup Week 12 against the Cardinals, Square will revert to his position as a backup. Coach Anthony Lynn said Bosa's left foot is "a little sore" following Sunday's 23-22 loss to the Broncos, Eric D. Williams of ESPN.com reports. Analysis: Making his season debut Sunday, Bosa notched one solo tackle and no other stats on 31 (of 56) defensive snaps. Lynn relayed Bosa played a bit more than the expected 20 such snaps and emerged from the game "fine." Bosa is expected to increase his workload this coming Sunday against the Cardinals, but first he'll have to manage some residual discomfort in his left foot. Bosa (foot) is officially active for Sunday's game against the Broncos, Eric D. Williams of ESPN.com reports. 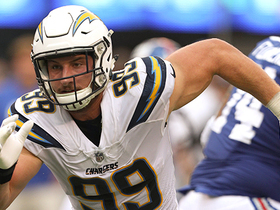 Analysis: Bosa returned to practice this week as a limited participant and received a questionable tag, but he was expected to be available for his season debut Sunday. Given the extensive layoff, the 23-year-old isn't expected to carry a full snap share, with his workload likely to depend how he feels early in the contest, Ian Rapoport of NFL Network reports. Bosa (foot), who is listed as questionable for Sunday's game against the Broncos, is expected to play, Adam Schefter of ESPN reports. "I'd be shocked if [Bosa] doesn't [play]," a source told Schefter. 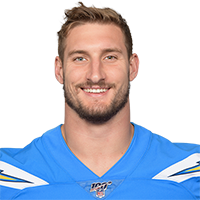 Bosa (foot) is listed as questionable for Sunday's game against the Broncos, Ricky Henne of the Chargers' official site reports. Analysis: Bosa returned to practice as a limited participant this week, with his involvement in sessions Wednesday through Friday a fantastic sign for his health. Even if cleared to suit up Sunday, the 23-year-old is likely to face some limitations as the Chargers exercise caution with the defensive end in his first game in 2018. With that in mind, Damion Square and Isaac Rochell should both be in store for decent-sized snap shares regardless if Bosa makes his debut or not. Bosa (knee) has a chance to make his season debut against the Broncos on Sunday, Steve Wyche of NFL.com reports. Bosa (foot) was listed as a limited practice participant Wednesday. Bosa (foot) will return to practice Wednesday, taking part in individual drills and possibly even some team drills, Ricky Henne of the Chargers' official site reports. Analysis: Bosa is taking a big step forward in his lengthy rehab process, though a return for Sunday's game against the Broncos might be pushing it. His presence on the field would provide a massive boost to a Chargers defense that already seems to have found its groove without the help of the No. 3 overall pick from the 2016 NFL Draft. Bosa (foot) was ruled out for Sunday's game at Oakland. Analysis: Bosa has been doing change-of-direction drills over the past week-plus, Eric D. Williams of ESPN.com reports, but he has yet to return to practice in an official capacity. The 23-year-old has no firm timetable for his return, but next week's game against the Broncos remains a possibility for him to make his season debut. Isaac Rochell and Damion Square should continue to see increased snaps at defensive end in his absence. Bosa (foot) did not practice Wednesday but is participating in drills on the side, Eric D. Williams of ESPN.com reports. Analysis: Bosa reportedly began doing change-of-direction drills more than a week ago, so the third-year defensive end does appear to be making notable progress in his recovery from a lingering foot injury. While it appears that Bosa is getting closer to making his 2018 debut, he's still a long shot for the Chargers' tilt against Oakland in Week 10. For the time being, expect Isaac Rochell and Damion Square to continue splitting snaps at the defensive end position. Bosa (foot) is ruled out for Sunday's game against the Seahawks. Analysis: Bosa never had a real shot at suiting up Week 9, and he'll remain sidelined as he continues to nurse a mid-foot strain sustained in August. The third-year pro has yet to make his 2018 debut, but the Chargers still seem to expect that Bosa will play this season. As long as Bosa is unable to suit up, expect Isaac Rochell and Damion Square to continue splitting snaps at defensive end. Bosa (foot) was a non-participant in Wednesday's practice. Analysis: Bosa has yet to play this season after suffering a mid-foot sprain in August. Although he's unlikely to play Sunday against the Seahawks, he hasn't officially been ruled out yet, which seems to suggest he has made progress on some level coming out of the Chargers' Week 8 bye. Until Bosa gains clearance to make his season debut, expect Isaac Rochell and Damion Square to handle most of his snaps at defensive end. 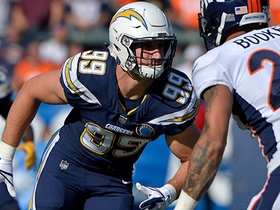 Bosa (foot) voiced his confidence in recovering from his injury Tuesday but didn't put an exact timetable on his return, Ricky Henne of Chargers.com reports. Bosa is making progress in his recovery from a mid-foot sprain but isn't "anywhere near ready to play right now," a source told Adam Schefter of ESPN. Bosa (foot) remains in line to make a return for Week 9's game in Seattle, Eric D. Williams of ESPN.com reports. Analysis: Bosa is still rehabbing the injury, but it looks like the defensive end will be using the team's bye in Week 8 to put some real work in on the field. Bosa will remain out this week, but another update on the status of his recovery should come once the team returns to regular practice after the bye. Bosa (foot) will not travel with the team to Cleveland, Eric D. Williams of ESPN.com reports. Analysis: The report confirms that Bosa won't play in Week 6 action. The target date for a return remains closer to Week 9, but nothing appears set in stone at the moment. Bosa's status for Week 7 remains in doubt considering his cast was removed just two weeks ago. Bosa (foot) has been ruled out for Sunday's game against the Raiders, Eric D. Williams of ESPN.com reports. Analysis: Bosa's status for Sunday's game was not in question, as the team has made clear his expected return is not until around Week 9. The Chargers have survived thus far without their elite pass rusher thanks to contributions from Isaac Rochell up front. Barring any unforeseen circumstances, Bosa will remained sidelined for several additional weeks. Bosa (foot) indicated Wednesday that he expects to be sidelined at least through the Chargers' Week 8 bye, ESPN's Eric D. Williams reports. Analysis: Bosa had his cast removed this week and is in a protective boot at this stage. Given that he still has instability in the tendon of his bruised left foot, it looks like the earliest he might see game action is Nov. 4 against the Seahawks. Bosa (foot) will have his cast removed soon and has been ruled out for Sunday's Week 4 game against the 49ers, Eric D. Williams of ESPN.com reports. Analysis: It was originally thought that Bosa's cast would be removed Sunday, and though that didn't happen, it remains imminent. He'll be in a walking boot for the time being. Bosa is on track to miss his fourth consecutive game with a bone bruise and isn't expected back until some time in October. Bosa is scheduled to have his cast removed Sunday from his injured left foot, Adam Schefter of ESPN reports. Analysis: Bosa has yet to play this season while recovering from a significant bone bruise and is likely at least another week or two away from making his 2018 debut. While getting the cast removed amounts to a step forward for Bosa in his recovery, he'll still be confined to a walking boot for the time being when he's not rehabbing or working out. Bosa (foot), who is inactive for Sunday's game against the Bills, is expected to be sidelined into October, Adam Schefter of ESPN reports. Bosa (foot) has been ruled out for Sunday's game against the Bills, Ricky Henne of the Chargers' official site reports. Analysis: Bosa, who is dealing with a bone bruise in his foot, will continue to proceed on a course of rest and rehab. As such, he remains week-to-week beyond Sunday's contest. Isaac Rochell is thus in line to continue filling in as a starting defensive end for the Chargers while Bosa is out. Chargers head coach said Thursday in an interview with Ross Tucker of SiriusXM NFL Radio that Bosa (foot) "will probably be gone for the next couple weeks." Bosa was diagnosed with nothing more than a bone bruise in his left foot after meeting with Dr. Robert Anderson in Green Bay on Wednesday, Ian Rapoport of NFL Network reports. 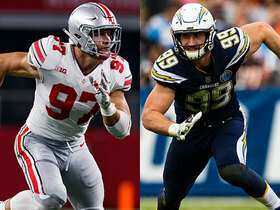 Analysis: Bosa still faces a "week-to-week" recovery timeline, but fears within the Chargers organization that he might be dealing with a fractured foot seem to have been allayed. Despite having two more chances to take the practice field before week's end, it would be a surprise if he Bosa logs anything more than limited reps. While the team has yet to rule Bosa out for Sunday's game in Buffalo, Adam Schefter of ESPN reports the pass rusher is unlikely to make an appearance Week 2. Bosa is scheduled to travel to Green Bay on Wednesday to meet with foot specialist Dr. Robert Anderson for a second opinion, Ian Rapoport of NFL Network reports. Bosa could miss 2-to-4 weeks with a bone bruise in his foot that the team fears is a fracture, Adam Schefter of ESPN reports. Analysis: Bosa has already been deemed out for Sunday's opener against the Chiefs, but a possible four-week timeline is tough to swallow. The 23-year-old racked up 23 sacks over his first two seasons in the league. For now, Isaac Rochell will be the Chargers' starting left defensive end. Bosa (foot) has been ruled out for Sunday's game against the Chiefs. Analysis: Bosa was seen at practice Friday sporting a walking boot, so this news, which represents a huge hit to the Chargers' team D in Week 1, isn't surprising. Not having to deal with Bosa -- whose listed backup is Isaac Rochell -- is also a big break for Chiefs' QB Patrick Mahomes. Beyond the Bolts' season opener, coach Anthony Lynn refers to Bosa's status as "week-to-week." Bosa was seen sporting a walking boot during Friday's practice, Jeff Miller of the Los Angeles Times reports. Analysis: Head coach Anthony Lynn said Thursday that it was possible Bosa would not be available to play in Sunday's season opener, and the star defensive end wearing a walking boot Friday certainly is not a good sign. Bosa's absence would be a big hit to the Chargers defense, and the 23-year-old will likely end up being a game-time call Sunday. Bosa (foot) is no lock to play Sunday against the Chiefs, Jack Wang of the Los Angeles Daily News reports. "It's possible that he might not be with us," coach Anthony Lynn noted of the Chargers' starting DE. "Foot injuries, they take on all the body weight. That can be tricky." 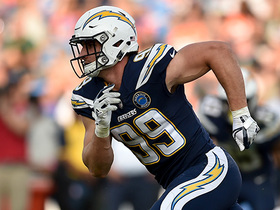 Analysis: More on Bosa's Week 1 status no later than Friday, but if he misses the Chargers' opener, it would be a big hit to their fantasy team D, as well as a tough break for those relying on Bosa in IDP formats. Bosa (foot) was a limited participant at Wednesday's practice, Jack Wang of the Los Angeles Daily News reports. Analysis: Bosa, the headliner of the Los Angeles defense, is still expected to play Week 1 against the Chiefs. There's a good chance the Chargers are playing it safe with the prized defensive end while he manages a sore left foot. Unless his condition takes a turn for the worse during practices Thursday or Friday, Bosa will be able to suit up Sunday without any restrictions. Coach Anthony Lynn said Bosa (foot) will play Week 1, Jack Wang of the L.A. Daily News reports. Analysis: Bosa missed his third preseason game due to the injury, as the Chargers likely didn't want to expose him to any risk. Wang adds that Bosa likely could have played if Saturday's preseason game had been a regular-season contest. Bosa (foot) may be able to practice Tuesday on a limited basis, Jack Wang of the Orange County Register reports. Analysis: Bosa has missed back-to-back preseason games due to a minor foot injury, but he could be ready for limited reps during Tuesday's practice. The former third overall pick won't be rushed into action, however, as the Chargers have no reason to risk the health of their star defensive end. Bosa (foot) will not play in Saturday's game against the Seahawks, Jack Wang of the Los Angeles Daily News reports. Analysis: Bosa will miss at least the first two preseason contests as a result of a foot injury sustained during practice Aug. 7. The Chargers are likely just being cautious, as it's not believed to be a serious problem. Look for him to suit up Week 1 against the Chiefs unless something between now and then suggests otherwise. Bosa (foot) won't play in Saturday's preseason opener against the Cardinals, Kent Somers of The Arizona Republic reports. Analysis: This comes as no surprise after Bosa sustained a minor foot injury in practice this week. His absence should allow Isaac Rochell to open Saturday's game with the first-string defense. Bosa appears to have suffered just a minor foot issue and is expected to be fine, Adam Schefter of ESPN reports. Analysis: The initial news that Bosa hobbled off likely caused Chargers fans' hearts to skip a beat, but it appears there's not much to the issue. It's best to consider him day-to-day moving forward. Bosa was removed from Tuesday's practice with a foot injury, Jack Wang of the Los Angeles Daily News reports. Analysis: Bosa walked off the field under his own power and is headed for further evaluation. He had surgery on a finger during the offseason but doesn't seem to have dealt with any limitations in practice. The 23-year-old is already one of the most valuable non-quarterbacks in the league, with 111 tackles, 23 sacks and five forced fumbles through 28 NFL games. Bosa (finger) underwent surgery this offseason, Dan Woike of the Los Angeles Times reports. Analysis: Bosa has been dealing with a dislocated finger on his right hand since 2016 and battled through the injury all of last season while recording a team-leading 12.5 sacks. He elected not to play in the Pro Bowl due to the injury, but it looks like the surgery will take care of any lingering issues Bosa was dealing with. Expect the young defensive end to be ready to take part in offseason workouts when they come along. Bosa won't play in the Pro Bowl due to a finger injury, Dan Woike of the Los Angeles Times reports. Bosa tallied five tackles (two solo), a sack and a recovered fumble in Sunday's win over the Raiders, bring his season sack total to 12.5 to end the 2017 campaign. Bosa piled up seven tackles, one sack and a forced fumble in the 19-10 win over the Browns on Sunday. Analysis: Bosa was back to his usual self after failing to register a sack last week, picking up a critical strip sack in the fourth quarter as the Browns were mounting a rally. The second-year defensive end also led the team in tackles Sunday, part of an overall dominant day for Bosa. Bosa recorded four tackles in Thursday's 28-6 win over the Cowboys. Analysis: It's probably a compliment to Bosa that a four-tackle day for a defensive end is a disappointment. But given the second-year pass rusher had his six game sack streak snapped Thursday, it certainly could be viewed as such. It wasn't as if Bosa was kept in check though, as the 22-year-old very nearly missed a sack on three separate occasions, only for the elusive Dak Prescott to scramble away. Bosa picked up one sack and forced a fumble in the 54-24 win over the Bills on Sunday. Analysis: That's now six straight games with at least a half sack for Bosa. 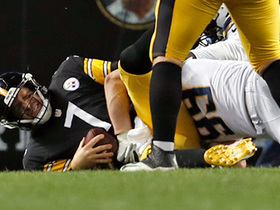 While the second-year pass rusher didn't put together an impressive stat line for IDP owners, four of the five interceptions thrown by Bills rookie quarterback Nathan Peterman in the first half were a direct result of Bosa's pressure, and the fumble forced was taken back for a touchdown by Melvin Ingram, part of an overall dominant day by the Chargers defense. Bosa tallied another sack as well as four tackles (three solo) in the 20-17 overtime loss to the Jaguars on Sunday. Analysis: Bosa picked up a critical roughing-the-passer penalty in the fourth quarter that helped extend a Jaguars drive, but it was still a productive day for IDP owners who used Bosa. At this point, the second-year pass rusher has developed into one of the best overall defensive lineman in the entire NFL, and should be a consistent start for fantasy owners week in and week out. Los Angeles Chargers defensive end Joey Bosa hits lineman with a spin move for the Chargers' first sack. 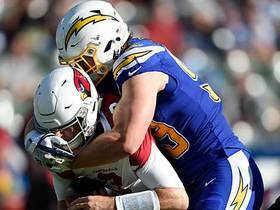 Los Angeles Chargers defensive end Joey Bosa makes his second sack of Week 12 on Arizona Cardinals quarterback Josh Rosen for a loss of 7 yards. 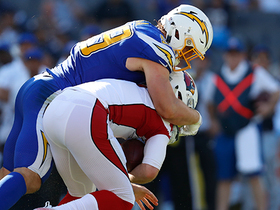 Los Angeles Chargers defensive end Joey Bosa makes his first sack of the season, setting Arizona Cardinals quarterback Josh Rosen back 11 yards. 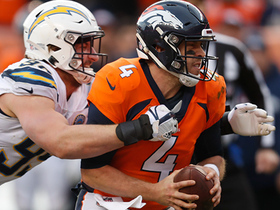 Los Angeles Chargers defensive end Joey Bosa pressures Denver Broncos quarterback Case Keenum on third-down throw. 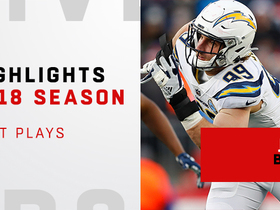 NFL Network Insider Ian Rapoport has the latest on Los Angeles Chargers defensive end Joey Bosa making his season debut.